It has been a long week. Not only were there the usual responsibilities of working and parenting - but there were a few meetings and a couple of other tasks thrown into the mix as well. It's not like they weren't important, they were - there just isn't a lot of "wiggle room" in my daily routine, and I was feeling a bit overwhelmed. The weather has been a little gloomy too. And, while I'm grateful for the rain and the cooler temperatures, it just makes it a little harder for me to crawl out of bed to face the day. Throughout the week, God has been faithful. I've seen Him at work - clearing a bit of time here, and taking away another responsibility there. He has a way of "Redeeming the Time" for me, for which I am always grateful. I knew today would be no exception. I wasn't sure I would be able to fit what needed to be included into today. 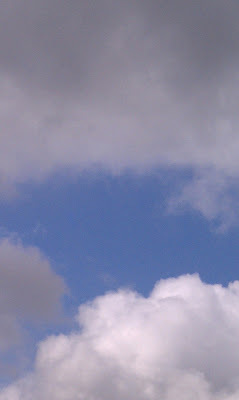 But mid-morning, I saw this - a Carolina blue bursting forth through the overcast sky! God's little reminder to me that NO MATTER WHAT I see before me - He is there. It doesn't matter if clouds roll in.... they are temporary. He is eternal. Whatever challenge is standing before me... He is there.